President Donald Trump is wrapping up 12-day, five-nation tour of Asia dominated by talks on the North Korea nuclear threat and bolstering trade. After talks in Manila on Monday with the prime ministers of Australia and Japan, Trump promised to make a "major statement" on North Korea and trade when he returns to Washington this week. But he offered no details. Trump's meeting with Australia's Malcolm Turnbull and Japan’s Shinzo Abe underscored the growing relationship between the three nations in the face of regional security issues. The top concerns include North Korea’s nuclear weapons and ballistic missile programs and countering China’s increasingly assertive maritime territorial claims. “The key for us is to ensure very close trilateral cooperation so as to bring peace and stability on the ground,” said the Japanese leader, who has been displaying a united front against North Korea with Trump. A massive naval drill involving three U.S. aircraft carrier strike groups was underway in western Pacific waters as a show of force. 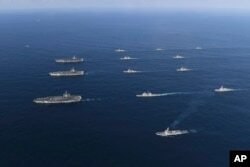 The U.S. naval vessels and aircraft were joined by elements of the South Korean navy and Japanese Maritime Self Defense Force. The three leaders met on the sidelines of the Association of Southeast Asian Nations (ASEAN) summit. Trump said "big progress" had been made on trade but he did not offer further details. Three U.S. aircraft carriers USS Nimitz, left top, USS Ronald Reagan, left center, and USS Theodore Roosevelt, left bottom, participate with other U.S. and South Korean navy ships during the joint naval exercises between the United States and South Korea. Earlier Monday, the U.S. leader met with Philippines' President Rodrigo Duterte, who hosted the ASEAN summit. Trump said the two have "a great relationship" and described their talks as "very successful." A joint statement released by the U.S. and Philippines said the two leaders condemned Pyongyang's "unlawful nuclear weapons and missile development" and urged all nations, including those in the region, "to voice their opposition to these threatening programs and to take steps to downgrade their diplomatic and economic engagement with North Korea. During a joint appearance, reporters tried to query whether Trump had raised the issue of human rights with Duterte. Duterte, facing strong criticism from human rights groups internationally, replied, "Whoa, whoa. This not a press statement. This is the bilateral meeting." 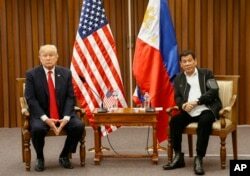 U.S. President Donald Trump, left, and Philippine President Rodrigo Duterte hold a bilateral meeting on the sidelines of the 31st ASEAN Summit at the Philippine International Convention Center in Manila, Philippines. Nov. 13, 2017. Earlier, as regional leaders gathered at a colorful ceremony to open the summit in Manila, Duterte sidestepped the controversy over his war on illegal drugs and its thousands of extrajudicial killings. In opening remarks before the 17 other leaders at the summit’s plenary session, he called illegal drugs a “menace” that threaten “the very fabric of our society,” without mentioning methods of the response. 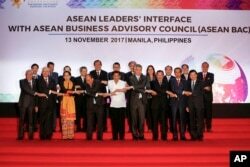 Philippine President Rodrigo Duterte, front center, links arms with heads of state and government participating in the ASEAN Summit in Manila, Philippines, Nov. 13, 2017. The communique resulting from the talks is expected to announce that ASEAN will begin official negotiations for a code of conduct for the South China Sea, where several nations have conflicting territorial claims. A number of countries have concerns about China’s increased militarization of disputed islands it controls. For a second day Monday several thousand militant protesters marched in Manila, clashing with riot police who responded with truncheons, water cannons and sonic alarms to keep the demonstration out of sight of the delegates at the ASEAN Summit, which is surrounded by a security cordon. Protesters burned an effigy of Trump on Monday. Some protesters pushed the police, organizer Renato Reyes told VOA News, who said "scores" of protestors had been injured and some had to be treated at an on-site clinic. The protesters shouted for Trump to leave and accused the United States, a former colonizer of the Philippines, of looking for overseas wars. 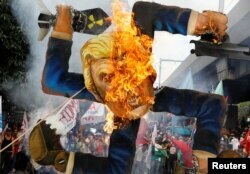 Protesters burn an effigy of U.S. President Donald Trump, who is attending the Association of Southeast Asian Nations (ASEAN) Summit and related meetings in Manila, Philippines, Nov. 13, 2017. Local media reported 10 people were injured, including six police officers. Trump has praised his hosts during the Asia tour, which included stops in Japan, South Korea, China, Vietnam and the Philippines. "It was red carpet like nobody, I think, has probably ever seen," Trump told reporters. Ralph Jennings and Kenneth Schwartz contributed to this report.